Downpour is the enchanting story of a rainy day turned magical. A rainy day is usually the time to clomp around in rubber boots and discover worms and puddles and other such rainy day things. But this is no ordinary rainy day. 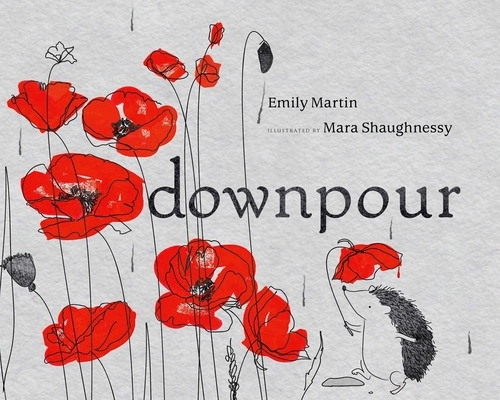 Embark on a journey of discovery as the rain begins to wash away the color from the bright red poppies in a field. Follow the color red on its journey, page after page, as it infuses myriad quirky and everyday objects with its bright cheerful hue: from the beaks of curious birds to the big wheel at the faraway fair. In a fresh, poetic style, with bright splashes of color on each page, this high contrast book will allow young readers to learn about color and build their vocabulary while stimulating their senses.